Alabama State, with a veteran lineup returning, hopes to get back to winning the SWAC East Division title. Last season the Hornets were loaded, but both hitting and pitching underachived at the conference championship. Aside from that, they have become a consistent program. Heading into the 2019 baseball season ASU has reloaded adding arms to a veteran lineup with a nice blend of freshman and JUCO transfers. Top new recruits, AJ Stinson – RHP / Hattiesburg, Mississippi, Hunter May Catcher / Slidell, Louisiana, Luis Nunez Outfielder/LHP Cidra, Puerto Rico, Jorge Rivera Catcher Orlando, Florida, Ricardo Rivera – LHP San Juan, Puerto Rico, Angel Jimenez 3Base/Outfield Santo Domingo, Dominican Republic, Jorge Perez – RHP Miami, Florida, Manny Bezares – INF/RHP Orlando, Florida and Jeremy Rivera – LHP Toa Alta, Puerto Rico. With a good core of veterans and what appears to be impact talent from the high school and JUCO ranks, the baseball program should have depth like its had in past years. There should be competition in all areas on the field, but heading into 2019, whether or not it leads to an another SWAC division title and conference championship remains to be seen. Top returning hitters, Noel Cheneau move from 2B back to the outfieldYamil Pagan – outfielder. First year head coach Jonathan Hernandez has some nice problems. The 2019 Bethune Cookman Wildcats will be heavily stacked with Juniors and Seniors, that will have a lot of experience heading into the 2019 season. Seniors Nate Sterijevski, Danny Rodriguez, Zach Spivey will be leading the charge offensively for the Wildcats. On the mound the Wildcats will feature 2 time MEAC Pitcher of the Year , Junior RHP Anthony Maldonado as the ace, while Redshirt Sophomore RHP Brady Norris, and Senior RHP Tyler Krull will round out the weekend pitching rotation. In the bullpen the Wildcats will lean on the experience of Seniors Jordan Pinto, and Brandon Wilkes as primary candidates to close out games for the Wildcats. Junior College Transfer from Yavapai College, Outfielder Over Torres , looks to add some thump in the line up for Bethune Cookman. Over who excelled at Yavapai College ended his 2018 Sophomore season in JUCO hitting .361 with 7 HR and 44 RBI’s. Good freshman recruiting class RHP Seth Lovell will be counted on to provide quality innings for the Wildcats this season. RHP Carlos Lequerica from Miami, FL will also be called upon to pitch heavily for Bethune Cookman this year. This clearly the most talented team Sherman Reed had in eight years as head coach at Coppin. The entire pitching staff returns from last year’s conference best 18-4 record and Northern Division Championship Team. Including last year’s three weekend conference starters in Jahmon Taylor (sr), Aaron Rae (jr) and Branden Redfern (sr). The conference’s top closer and Coppin State career save leader, Corey Treyes (jr) also returns. This group contributed to having the top ERA in conference games in 2018. The addition of LHP Jonathan Rice (fr), Matt Urban (fr), and big RHP from Canada Carter Harbut (fr) will add additional punch to an already deep pitching core. Florida A&M is extremely excited about the team they will put on the field this season at FAMU. After losing 13 seniors last year, including top five hitters, there will be a lot of new faces on the field this season. FAMU have a nice combination of young players mixed in with some veteran leadership. There is a lot of upside to this group. Different from previous years, the pitching staff could end up being the strength of this years squad. In three exhibition games this fall the pitching staff boasted a 2.00 ERA in 27 innings and help opponents to a .168 average while striking out 39 and walking 12. A big strength of the staff will be the bullpen. Returning First Team All MEAC closer Dylan Carlson, go to reliever Jamie Grant, and set up man Chandellor Benton. The rotation has yet to shake itself out but Jr. RHP Josh Wilson had a good fall and has established himself as one of the guys along with two 6’7 JUCO transfers Kyle Coleman (South FL State College) and Josh Hancock (Seminole St. College). Sophomores Jeremiah McCollum, Josh Barr and Pedro de los Rios will also see significant innings. Returning from last years team (.279). Center fielder Willis McDaniel (Sr.), catcher Brett Maxwell (Sr.) and second baseman Octavien Moyer (Jr.) are the other starters that are returning. There might be a shortage in power from previous yeas but this a scrapy group of players that will be tough outs all the way down the lineup. Grambling State was just one game shy of winning the SWAC Tournament Championship last season and the Tigers will look to get back to the title game this season. Grambling State lost Marshawn Taylor as the senior was the lone player last season to bat over .400 (.404). Taylor, who had two great seasons for the Tigers, was selected in the 28th Round by the Arizona Diamondbacks in the 2018 Major League Baseball Draft. The Tigers enter this season having to reshape a team that for two years was on the verge of winning a SWAC Championship. James Cooper is back and sits just 18 victories shy of 200 for his collegiate coaching career. Also back is Rafael Ramirez, who led the Tigers in homers (17) last season and was a CoSIDA Academic All-American. Grambling added some good high school position players to the roster this year who have a chance to contribute early as freshmen. Warren Laster, an All-District/All–State outfielder from Manvel HS in Houston, Texas. Chrystian Mervilus Riverdale Baptist in Maryland where he was an impact player. Grambling State opens the season Feb. 15 in New Orleans at the Andre Dawson Classic and will face Eastern Kentucky, Southern and Alabama State. The Jackson State Tigers return weekend main stays Kevin Perez and Nikelle Galatas along with everyday position players returning Raul Hernandez, Wesley Reyes, Tyler Culpepper and Dezmond Chumley. This group is surrounded by a lot of new faces with a lot talent but lack inexperience at this level. Hopefully the group of returners can lead this group and some of the other returners step up and have a big years as well. New faces that will be counted on this year: Jaylyn Williams, Chris Prentiss, Kelani Luke, Chandler Dillard, Anythony Becerra-Lopez, Mario Lopez, Francisco Urena, Brandon Valentin, Equon Smith, Tyler Jones, Josh Green, Marshal Luiz, and Josh Swartz. If these guys perform like they are capable of we have a team primed to do some damage in league play and a tough nonconference schedule. If the pitching staff throws the ball over the plate and positions guys behind them field to their ability we will be a contender for division championship and SWAC conference championship. With the short time of practice before season starts the gel process will have to come quickly. The Tigers will be primed and ready to go once the season gets here. Head Coach Omar Johnson will be looking for his 12th 30 win season since 2007. Mississippi Valley State University head baseball coach Aaron Stevens, since starting team practices, “a few freshmen will get some playing time this year and help the team.” Mississippi Valley has two pitchers who should get a good amount of innings, two infielders with opportunities to play and two catchers who will split time behind the plate. Top incoming freshmen Gerald Pintarich, Good arm and command of his pitches. Ashton Spurgeon, will be depended upon as a starter in the pitching rotation. Infielders Antonio Walker and Christian Reed will have an impact offensively and defensively. Catchers Jan Tolentino and Jonathan Alaniz will see playing time behind projected starting catcher/closer Aaron Barkley. Mississippi Valley added two transfers who are projected at this time to play. Top transfers outfielders Chase Colding and Billy Leflore bring speed in the gaps. MVSU has a little more depth on the mound this year with seven pitchers. Top returners LHP Jeremiah Barr and RHP Sherrod Reed. The team will continue to work towards being a top contender in the SWAC conference this upcoming 2019 season. The Aggies return a ton of experience and really like their maturity. In 2019, they return a wealth of experience on both sides of the ball returning 7 starters in the field including 2017 1st team All MEAC SS Brandon Melendez (Missed 2018 with injury). 1st team ALL MEAC performers OF Dawnoven Smith, INF AJ Hunt and MEAC Tournament MVP 1B Zach Mclean return a solid middle of the order. NCA&T bring back 2 of their weekend Pitchers including 1st Team all MEAC RHP Michael Johnson, and RHP Tim Luth. Return 7 pitchers from a staff who led the MEAC in earned run average and saves in 2018. The last 2 seasons our record when leading after the 7th inning is (38-1). Teams biggest loss from 2018 season roster wise will be replacing RHP Josh Bottenfield and RHP Josh Stikeleather in the bullpen. Coming out of the fall, the additions to the roster a couple new players to keep an eye on are middle IF Dustin Baber (Daytona State). He was a 2018 NJCAA D1 Gold Glove winner. Had an outstanding fall and will bring a very consistent defensive presence to our middle infield. RHP Evan Gates (Mott CC) had an outstanding fall. Consistently 90-92 with a very good slider. Incoming freshman RHP Gianni Smith (Winston Salem, NC) finished the fall on a high note, 88-91 with a good slider. Gianni has a good arm and has a chance to impact our 2018 season. OF Donte Wade (Spartanburg, SC) had a solid first fall. Showed a very good defensive ability in Centerfield. Look for him to impact 2018 season. INF Conner Knapp(Cary, NC) was probably the biggest surprise of the fall, left handed hitter has a knack for getting hits. The Eagles are fresh off their first winning season with a school-record 28 wins, and also gained votes in the NCBWA Top-30 poll for the first time in program history. Head coach Jim Koerner returns for his eighth season at the helm NCCU baseball. The 2019 schedule will challenge and prepare the team for what will be a very challenging season. Tough nonconference opponents open the season with NCAA Regional participant, Canisius College, is an immediate measuring stick and will help set the tone for what’s to come. NCCU won 18 games at home during the 2018 campaign. The Eagles get home cooking as 16 of the first 18 games will be played at home including the three-game home series against Canisius that will begin opening the 2019 season February 15. Tough schedule includes Presbyterian, Lafayette, rank North Carolina State Wolfpack, High Point, Campbell, Davidson, Longwood, and Duke round out the non-conference opponents for the Eagles. Norfolk State returns 3 of its top 4 hitters and 4 of its top 5 pitchers from last year’s team, which was beset by injuries prior to and during the season but still managed a second-place finish in the MEAC North. Leading the way among the returners are All-MEAC OF Justin Hayes, who led the MEAC with 28 steals and was 3rd with a .347 batting average. He is a prototypical lead-off man. Alsander Womack had a stellar rookie year at 2B and should help anchor the lineup after batting .319 with 5 HR and 30 RBI last season. Womack and junior DH Stephen Baughan, who led the MEAC with 9 HR last season, give NSU a strong middle of the order. NSU will rely on the return of SS Adam Collins (missed 2018 due to injury) and an influx of new players to round out its starting lineup of position players. The Spartans have 15 newcomers, including 7 who transferred from JUCOs or Division I programs. 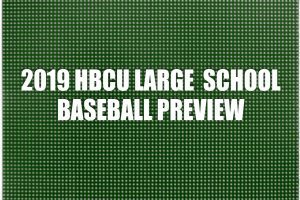 The pitching staff will again rely on right handers Chase Anderson (second-team All-MEAC) and Jonathan Mahoney (MEAC leader in complete games), but will also get an infusion of depth from the recruiting class and return of a couple of injured players. Developing bullpen roles and depth will be a key for the team. Top freshmen right handed pitcher Justin Walton, catcher Ty Hanchey and pitcher/outfielder James Deloatch are among the team’s freshman to keep an eye on. Savannah State has a mix of veteran returners on the mound and will rely on a number of JUCO transfers in the field in 2019. On the mound, they return the only senior on the staff Caleb Hill who has shown flashes of being a steady starter in the past but has battled injuries the last two seasons. Other veteran starters returning are Luis Torres-Lopez, who started a few weekends last year as a freshman; and Tyler Robison, who was a weekday starter as a freshman in 2018. The bullpen will show a variety of submariners and hard throwers. JUCO transfer Matt Shunk (JR, Odessa College, RHP) should anchor the pen a hard thrower, Submariners Ian Concevitch and Ben Bothom will be middle guys. The wildcard for SSU on the mound is Justin Washington (6’4” 195 RHP, RJR) who is a professional prospect if he can stay healthy. Was 88-91 topping at 92 with a good curve ball. A few returning starters from 2018 but will mostly rely on JUCO guys in 2019. Returners Jalen Atterbury (SR and 2017 All MEAC player, 2B), Turner Davis (JR, C) and Garrett Bogart (SO, C) are all core players back who will be in the lineup. All three had great fall’s respectively and will be the backbone of SSU’s offense. JUCO transfers Joey Roberson (JR, Cleveland State College, 1B) and Luis Lamarche (JR, Roane State College, 3B) will anchor the middle of the lineup. There will be three freshman position players and one RHP who will see time in 2019. Trevor Meaney is slated to start at SS and Taylor Wilkinson is slated to start in CF. Both are really athletic and will be big parts of the Tigers getting back on top in 2019. Very exciting group with a lot of upside. Southern under second year head coach Kerrick Jackson improved tremendously by adding quality depth on the mound and in the field. The Jaguars have a few freshmen in Blake Martin (CIF), Brendon Davis (UTL), Christian Dixon (RHP), Bryce Ross (RHP), and Rhett Hebert (UTL/RHR), that have the potential to factor in to this year’s season significantly. Although they are freshmen, they have each shown a level of maturity and competitive spirit that would indicate they are ready to play! In addition Southern also added a number transfers; Eli Finney, Cole Jenkins, Jackson Cullen, Coby Taylor and Jerome Bohanon, “that have all had previous success, and an outstanding fall with us” according to coach Jackson. Top returners – Javeyan Williams L/L CF – athletic, toolsy, runner, good defender. Tyler LaPorte Utility/RHP – big league arm, lanky rangy frame, solid hands and feet, high contact rate at the plate, with gap type power. Michael Wright R/R LF – lanky athletic, speedster, bat has potential to be special, very high ceiling guy, solid Freshman year before he got hurt. Key Newcomers – Eli Finney RHP JUCO Transfer, solid 3 pitch mix, with heavy sinking fast ball, above average command, loves to compete, competing for rotation spot. Johnny Johnson R/R INF athletic, feel for the game, versatile, bat potential, run, should be a constant in our lineup. Cole Jenkins LHP – Grad Transfer, long lanky frame, experienced, upper 80’s, good command, competitor. Jackson Cullen LHR – JC Transfer, upper 80’s FB, above average breaking ball, will compete. Coby Taylor L/L CIF average defender, substantial addition to the middle of our lineup. Texas Southern will rely on team speed and championship pedigree this season after losing 11 seniors. Aron Solis (Sr- SWAC pitcher of the year 2018 will lead the pitching staff. Olijade Oloruntimilehin,Sr ( SWAC Tournament MVP) and Christian Sanchez,Sr (1st team All SWAC 17 home runs and 60 runs batted in) will provide Senior leadership along with Mason Furlong, Alexander Carillo, Keanu Van Kuren, Chris Suarez, and Ryan Diaz. Texas Southern strengths will be team speed, versatility in bullpen, experience in SWAC Championship Tournament. Pitching will be a concern. Several JUCO players will play key roles in the Tigers offense this year Charles Robinson ( Wharton CC) and Nic Garza ( Angelina CC ). Several freshman are expected to play this year infielder Alex Olguin, pitcher-Noe Guerrero, Alex Winger, and Holden Lane. Cannot count out head coach Michael Robertson. Well known as a second-half coach returning to the SWAC Championship game. The 2019 Maryland Eastern Shore baseball program has many new faces that will help the Hawks attempt to be one of the top teams in the MEAC North and ultimately the MEAC conference. The Hawks graduated 10 seniors, with only have 11 returning players from the 2018 squad. The Hawks will have 16 freshman joining the roster, which means the team, will be inexperienced. The goal for the season will be to grow and get better every game. The team will have some experienced Junior College players that will help in the development of freshman. The Hawks will have some experience on the mound. The Hawks will have three solid starting pitchers with a couple relief pitchers that will help with stability on the hill. The Hawks will also have returning experience in both the outfield and middle infield positions. The Hawks will have a solid core of returning players with the hopes that the younger more inexperienced players will provide depth and quality play when their number is called. Returning pitchers will provide experience for the younger players toeing the rubber. Dwayne Marshall, Marty Tolson, and Caleb Walston will head up the pitching rotation. Dillon Oxyer will provide talent and experience in the shortstop position, with Avery Tunnell, Blake Coleman, and Brian Cordell providing experience in the outfield. Hawks youth will be the biggest hurdle to overcome.